You guys. Our friend Anne is kind of a quiet authority on a lot of things. She's worked for Gourmet and for Architectural Digest, and she has all the friends and all the fun. Her kids are turning out SUPER. We spent a delightful evening at their house several years ago, and she served Knorr spinach dip. It turns out that for my whole life I've just been looking for a justification to serve this stuff every time we have a party with the slightest hint of a buffet. I didn't know it, but I absolutely was. Pretty much on the ride home from Anne's house we stopped at a supermarket and bought a Knorr vegetable recipe mix packet and some water chestnuts, and we've never looked back. This recipe — "recipe" — didn't make it to the website until we needed it for Spinach Dip Deviled Eggs, but don't blame the dip. That's on me. Anne says the water chestnuts are ESSENTIAL, and we couldn't agree more. Don't skip them. Use frozen spinach, not fresh. It's less expensive and works better in this recipe. Squeeze the everliving crap outta the spinach to wring every last bit of liquid out of it before mixing it into the dip. Don't skip the water chestnuts. They lighten up the dip and add some great texture. The scallions suggested on the package are truly optional. We never use them. Don't go nuts when hollowing out your bread bowl. Leave a 1/4- to 1/2-inch layer of soft bread inside to prevent accidental punctures. A regulation-sized boule should fit a batch of dip pretty much perfectly. Sourdough is the best bread. Any questions? 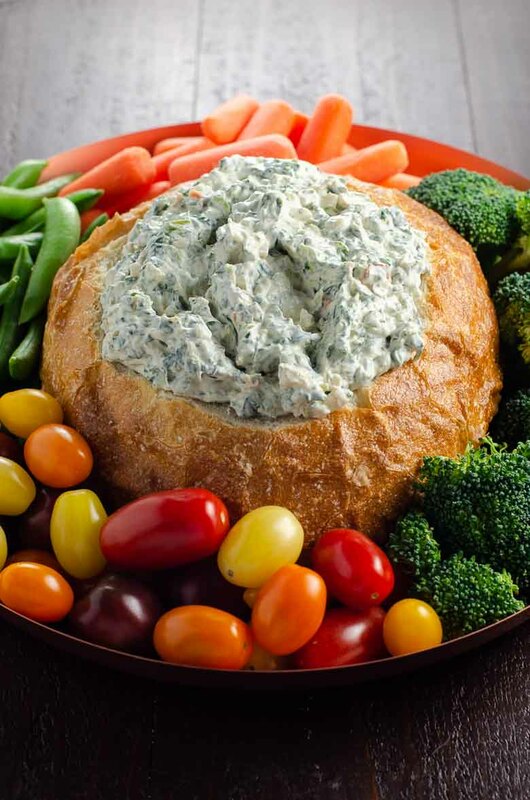 If you don't want to serve this dip in a bread bowl, you absolutely don't have to. Straight-up veggies work just fine, as do Triscuits, pita chips, and even hearty corn chips. Dip leftovers, should you have any, should keep in the fridge for a week — but only if they haven't been sitting out on the counter for hours first. If you think your crowd won't demolish the whole batch, start with a smaller bread bowl (or just a bowl bowl, to be honest) and leave some of the dip in the fridge, topping up your serving bowl as needed. No, you can't freeze leftover spinach dip. Neither mayo nor sour cream freezes well, and the spinach was already frozen. 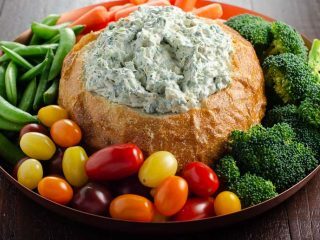 This is the good old Knorr spinach dip recipe served in a bread bowl with fresh veggies. It's a little uncharacteristic for Umami Girl to start a recipe with a seasoning packet from the supermarket, but we can't deny we love (and basically everyone with a pulse loves) this stuff. In a mixing bowl, stir vegetable recipe mix into mayonnaise and sour cream. Stir in water chestnuts and then spinach, breaking up any clumps. We like to use a fork to mix in the spinach. Chill, covered, for at least two hours. 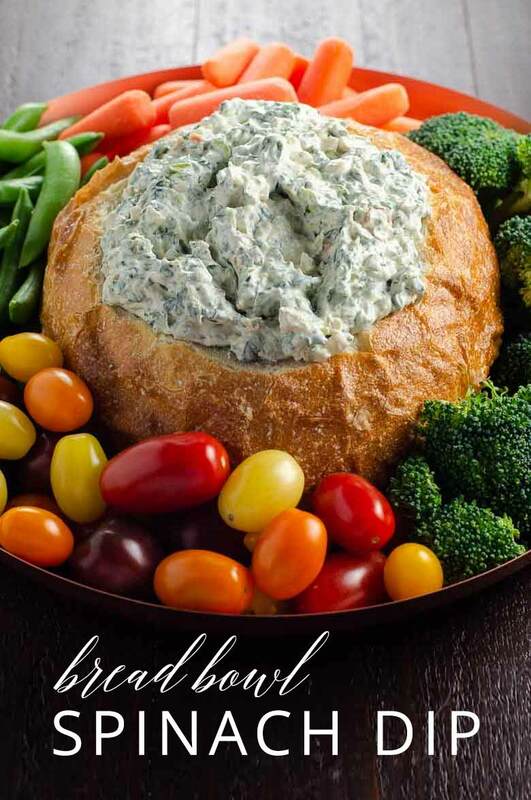 Fill bread bowl with dip place, in the center of a serving platter, and surround with fresh veggies for dipping.